At the 2018 PEN America Literary Gala, PEN America honored imprisoned Myanmar reporters Wa Lone and Kyaw Soe Oo with the 2018 PEN/Barbey Freedom to Write Award. 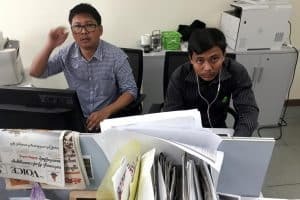 The journalists were arrested on December 12, 2017, and charged with violating the Official Secrets Act for their work investigating violence in Myanmar’s Rakhine state. Wa Lone, 31, and Kyaw Soe Oo, 27, are journalists who specialize in politically sensitive subjects. When arrested they were on assignment by Reuters investigating the torching and pillage of Inn Din, a village in Rakhine state, including the execution of 10 Muslim Rohingya men accused by the military of participating in political unrest. Their reporting contributed to an early February Reuters exposé on Inn Din, including vivid photographic evidence and numerous eyewitness accounts documenting the alleged atrocities. Myanmar military officials admitted to the killings on January 10 and have said that they are investigating the circumstances. If convicted under the colonial-era Official Secrets Act, the journalists, now held at Insein Prison in Yangon, face up to 14 years in prison. In its 2015 report, Unfinished Freedom: A Blueprint for the Future of Free Expression in Myanmar, PEN America details the fraught landscape for free expression in Myanmar, in particular for media freedom, in the years following the end of the military junta’s rule. Following the historic November 2015 elections, in which the opposition National League for Democracy (NLD) party won a decisive victory, and the establishment of a new civilian-led government in March 2016, hopes were high that the space for free expression in Myanmar would widen considerably. However, under the new government, journalists continue to be arrested and jailed for their work, while dozens of individuals have been threatened with legal charges for online expression under Section 66(d) of the Telecommunications Law. Working in partnership with PEN Myanmar, PEN America is campaigning for reform of the legal environment for freedom of expression and association, using our December 2015 report as a basis for advocacy. Concerted action is needed to abolish repressive laws, reform institutions, and support local civil society capacity to press for greater respect for free expression.